Become a GameReviewPad Contributor and rank up from Guest to Gold! Stay at a contributor rank that suits you! Those who commit themselves more will have more privileges. What Games Can You Review? Games that do not currently have a review on GameReviewPad. A different platform review of the same game is ok.
Indie game reviews are definitely allowed. Mobile game reviews will be allowed on a case-by-case basis at the Editor-in-Chief’s discretion at the Gold rank. How to be a writing contributor? Send Reviews as Word document attachments. Don’t forget to check the Review Guidelines & Review Structure before submitting content. Former GameReviewPad contributors that request to rejoin (now that a firm commitment is not needed) will be assigned a rank at the Editor-in-Chief’s discretion based on previous contribution experience. Ranks may be tweaked as necessary. Current contributors will be notified of any changes. Review Reserve requests and Reviews submitted via e-mail. New Releases Restriction: Bronze, Silver, and Gold contributors get a 10-Day priority window to reserve a review for a new release starting on the release date. Submit a review 2 months in a row OR Submit 2 reviews in 1 month. Receives a site login and submits review reserve requests through the site. Access to the private Contributor’s Only Discord server. Submit a review 3 months in a row OR Submit 3 reviews in 2 consecutive months. Allowed to place a hold on one additional game for your next review. (The review hold must me be for the following month and not a month you are skipping in order to keep things moving on the site.) Violators will have this privilege stripped. Submit a review 4 months in a row OR Submit 4 reviews in 3 consecutive months. Allowed to place a hold on a total of 2 additional games for your next reviews. (The review holds must only be for the immediate following months and must not include a month you are skipping in order to keep things moving on the site.) Violators will have this privilege stripped. Review Copy Access: Will be considered for covering Review Copies at the Editor-in-Chief’s discretion. Gold rank is the highest rank that can be achieved and has the highest responsibility and commitment level. You must wait for the game to be released before submitting a Review Reserve request. Review Reserves are first come, first served based on a given day. Rank or seniority (if same rank) breaks the tie. If you don’t submit content within the time frame you committed to you will banned from contributing. 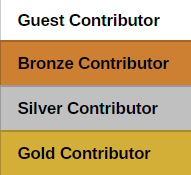 Your contributor year starts when you are promoted to Bronze rank. A contributor is allowed to turn down a promotion if they don’t want a greater commitment level, but their promotion clock will be reset. You don’t gain any extra months to skip when promoted or demoted. Anyone can be a guest contributor. The current list of Review Reserves will be available publicly. Send an email to [email protected] to get started contributing!